Up until to this point, I’d never heard of equine history, let alone thought about writing it. I considered myself a social and cultural historian. My Ph.D. centered on crime and dissent in early New England, and from this I published a biography of Thomas Morton. At this point, a few things happened simultaneously that led me to equine history. I discovered that my new home had a deep connection to equine history. Rhode Island was home to the first truly “American” breed of horse: the Narragansett Pacer. I instantly wanted to know more, especially how and when the breed emerged and why it became extinct. At this point in my career, I was looking for a new research topic and exploring the rise and fall of the Narraganset Pacer was the perfect fit. I’d always owned horses, and I’d competed in working hunter and side saddle classes growing up in the U.K. Thus, I started my first piece of equine history investigated Rhode Island’s own Narragansett Pacer. At the same time, I flew my own pony, Machno Cara, (a Welsh section C mare) from England to Rhode Island. When Cara crossed the Atlantic, my interest in Atlantic history and equine history came together in a way I could have never imagined. I started exploring how and why horses crossed the Atlantic in the seventeenth and eighteenth centuries, specifically New England’s equine export trade to the sugar colonies in the Caribbean and South America. I’m now hooked on equine history! When working on my article, “The Rise and Fall of the Narragansett Pacer,” I came across a Narragansett Pacer that Rip Van Dam of New York (later Governor of the State) owned who was quite a character! When Van Dam’s agent tried to ship the horse from Rhode Island in 1711, the horse jumped overboard and swam back to shore. When Van Dam finally got the horse home, he wryly noted that he “always plays and acts and never will stand still, he will take a glass of wine, beer or cyder, and probably would drink a dram on a cold morning.” This was my kind of horse! I just published an article entitled: “The Rise and Fall of the Narragansett Pacer,” in Rhode Island History, Winter/Spring 2018, Volume 76, Number 1, pp. 1-38. The article was accompanied by an exhibition of my research on the Narragansett Pacer, which was installed in the Providence Arcade from May to July 2018 by the Rhode Island Historical Society. I also just published a chapter entitled: “Trading Horses in the Eighteenth Century: Rhode Island and the Atlantic World,” in: Kristen Guest and Monica Mattfeld, eds., Equine Cultures: Horses, Human Society, and the Discourse of Modernity, 1700-Present (Chicago: University of Chicago Press, 2019.) At the moment, I working on a book project exploring New England’s exportation of horses to the sugar colonies in the Caribbean and South America in the seventeenth and eighteenth centuries. I have a sabbatical coming up next spring, and I’m looking forward to doing some more archival work in the Caribbean. I’m excited about integrating my research into my teaching, and I plan to develop a class on horses in the early modern Atlantic world at Roger Williams University. Merging my love of horses and Atlantic history is something I never knew (or dreamed) was possible. However, doing equine history is not always pleasant, especially when looking at shipping horses across the Atlantic. I found this out when working on shipping log books at the archives at Mystic Seaport. Captain Henry Bowers recorded the horrendous conditions for the horses on a voyage to St. Kitts on the Brig Gleaner. When the main deck filled with water, “the Horses began to give out.” Within an hour, most of the horses were “unable to stand,” despite of the crew trying everything to keep them upright. The crew tossed part of the awning and fifteen bundles of hay overboard to try to ease the vessel, but to no avail. When a hurricane struck the brig, nearly all of the horses fell and were in a “drowning condition.” The crew then “cut…the dead ones up and threw them overboard.” Disaster continued when the starboard quarter was struck and the crew desperately tossed more hay overboard. The assault continued and the ocean made “fair breach” on all sides of the vessel, at which point the Gleaner lost all her fowls and pigs. A few days later, on 23rd January they lost another horse, which left only eighteen alive out of the forty-three they started with. The horses that were still alive were “very much chaffed” when they finally arrived in St. Kitts on 2nd February. When the horses arrived the sugar colonies they often had a very hard (and short) life; especially if they were draught horses crushing the sugar cane. Gruesomeness aside, I hope to add to the rich historiography on both Atlantic history and equine history by centering equines in the story of trans-Atlantic trade and sugar production. PhD (2004), MA (2001), french « agrégation » in Spanish language (teaching accreditation, 2000) and BA (1998), Paris IV-Sorbonne University. The horse led me to History, more exactly to the history of Spanish equestrian culture in literature. One of my earliest memories is the contact with an horse’s warm, odorous and reassuring muzzle! I spent my childhood , with all kind of animals, in the landscapes of Normandy’s Orne department, a well-known region of equestrian breeding close to the historical Haras du Pin. This context and a passion for Golden Age literature and theater, mostly and both, explain my research interests, with a dissertation on Poetics of natural spaces in the comedia nueva (published in 2010, Casa de Velazquez, Madrid). My studies on open and natural spaces led me naturally to the important presence of horses in this Early Modern Theater. From space to horses, socio-dramatic mobility and equestrian symbolism in literature encouraged me to analyze, through dramatic texts, several aspects of the fascinating horse culture of the Spanish Golden Age and the Early Modern equestrian ideology, which are so predominant in these plays. 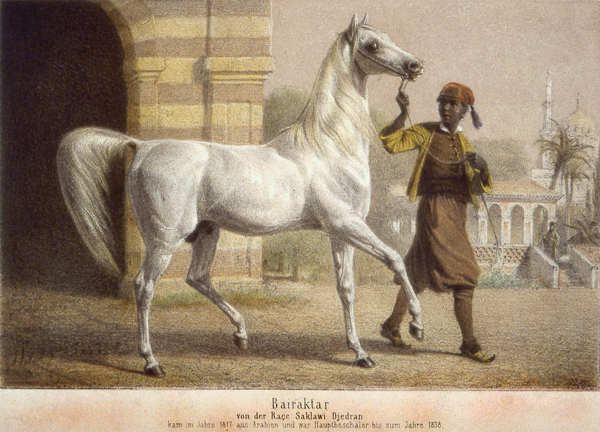 Who is your favorite historical horse ? My favorite historical horse should be Babieca, the Cid’s one, because of the special adaptation of horse and rider with each other, perhaps the first literary, equestrian and historical couple of Spanish literature. But you might have gathered that I prefer mythical and legendary horses to historical ones. And, of course, my favorite mythical horse is Rocinante because of his foundational stature, since in Cervantes’s words and poetics, he is the first horse of all horses by name (Rocín-ante means ambiguously ‘old horse-before’), as the origins of horse literary history. It brings me pleasure to think that these mythical figures and their ironic names (Babieca and Rocinante) transcend the tragic fate of so many labour and war horses they can have represented historically. How many such warm historical and anonymous muzzles should have needed some affectionate care ?! In some way, I would like to believe that their tragic historical beings can be redeemed from anonymity and sublimed by the fascinating horse history and especially the literary one under the tutelary figure of Pegasus. According to the regional importance of horses in Normandy, one of the specialisms of Caen University is research on horses in all fields. Some colleagues from my research team ERLIS have already directed a seminar on horse culture in several linguistics areas (L’Imaginaire du Cheval). As a Profesor of Spanish literature, after the publication of my monograph (Le cheval au théâtre dans l’Espagne du Siècle d’or, Orbis Tertius, 2018), I am continuing my own research on horse culture and poetics in Hispanic literature and I am thinking about directing some collective work on horse history and literature in Hispanic fields. Horses and history are a combination of my two great passions. As child I visited Marbach State Stud, one of the oldest horse breeding institutions in Europe, for the first time. I think this is the place where the whole horse fever broke out, which since then is a decisive part of my life. Marbach became the place of all my childhood dreams and I visited as often as possible. During my school time I spent most of the holidays at the federal riding school of the stud but this wasn’t enough, I needed to have own horses. I did for 25 years, participated in a number of fantastic long distance riding tours in North Africa and Europe, was working as riding guide in Iceland, groomed top sport horses up to championship level in Europe and North America and am involved in the organization of one of the most prestigious traditional horse shows of Germany since many years. My family supported my horse passion, but when I came up with the idea to become a professional rider my parents were not that enthusiastic. Thus, I studied subjects related to other fields I’m interested in: historic buildings, architectural conservation and cultural landscapes. I had the chance to spend a semester abroad at the University of Virginia and another one at Deakin University in Melbourne, participated in heritage workshops at Kakadu National Park and the World Heritage Centre in Paris where I also did an internship at the headquarters of ICOMOS (International Council on Monuments and Sites). During this time I learned about different concepts of heritage, about tangible, intangible and living aspects which often appear in combination. Still being very much horse oriented it was unavoidable to apply what I learned to equestrian heritage. I finished my Interior Architecture studies with a thesis about the Brandenburg State Stud Neustadt (Dosse) and after my two Master degrees I moved to Marbach, where I set-up a network of historic state studs. For seven years I acted as manager of the European State Studs Association with the objective to preserve and to promote European Stud Culture. This brought me in touch with the leading historic breeding institutions of Europe, including the former Imperial Stud Kladrub, today the Czech National Stud, which became a focal point of my activities. In 2016 I founded “Horses & Heritage” in order to raise awareness for equestrian heritage, which seems to be an often overlooked but absolutely essential part of human history. If I can name only one of all those wonderful horses who have accompanied humans in history, this is Bairactar, the favourite riding horse of William I. King of Wuerttemberg and the founding sire of the famous Weil-Marbach Arabians. My current research project deals with the architectural heritage and the cultural landscape of Marbach State Stud in Germany. With more than 500 years of history Marbach is one of the oldest horse breeding institutions of Europe. The first written record dates back to 1514. The stud was established by the dukes of Wurttemberg as their court stud to provide a stimulus for the improvement of horse breeding in the dukedom. It is located in the south-west of Germany and is part of the UNESCO biosphere reserve for the Swabian Alps. Marbach includes 960 hectares of land, three stud yards and four satellite farms. Two of them have developed from secularized monasteries. Generations of horses in their interaction with mankind have shaped the scenery and thereby formed a unique cultural landscape. The spacious stud premises, from administration and residential buildings, stables, barns, historic riding arenas to simple horses for herders at the remote summer stables, are registered as monuments as well as alleys, groups of trees, wells, bridges and open spaces. The architectural heritage is diverse. The origins of some buildings date back to the 16th century, but structures of the 19th century predominate. During the second half of the 20th century extensive construction works changed the face of Marbach and at the beginning of the 21st century a master plan was developed in order to improve the infrastructure for the growing tasks in the fields of education, events and tourism. Different new structures and building alterations have already been realized, others are still in preparation. Every development implies an intervention in the mature cultural landscape. Careful planning based on knowledge and understanding is essential to find adequate solutions. So far scientific work in connection with the stud has focused mainly on aspects of horse breeding and agriculture while the history of the stud premises lies largely in the dark. The objective of the dissertation project is to shed light on the historic connections within the Marbach cultural landscape and to explain its significance to lead to a better understanding for the future handling of this unique heritage. The Dissertation project is supervised by Prof. Dr. phil. Leo Schmidt at the Cultural Heritage Centre of the Brandenburg University of Technology Cottbus-Senftenberg. Horses fascinate and inspire us through their beauty, their elegance and their character. They fire our imagination, symbolize freedom, strength and power. They are ambassadors, build bridges and connect humans across borders and generations. Until a few decades ago the hoof-beat of the horse determined the rhythms of agriculture, transport, courtly representation, war and peaceful existence. Today, most people are not aware of the distinguished role horses used to play and accordingly they are not familiar with the cultural significance of the different breeds, their breeding places and the numerous evidences of the human-horse-relationship from prehistoric times onwards. Horses & Heritage is addressed equally to stakeholders of the equine and the culture sectors, horse lovers and heritage enthusiasts. I’m tying to fill the gap between theoretical research and real life offering presentations, publications, advice in heritage management and interpretation. My “Horses & Heritage” tours to the most precious historic breeding institutions, riding schools, equestrian collections and other places of interest are increasingly popular. You find further information and my contact data at http://www.horses-and-heritage.net. If you share my passions, I’d love to hear from you! Former equine veterinary technician . A lifetime with horses, a veterinary background, and the crucial discovery of STS while in an interdisciplinary humanities graduate program: it all came together that I could study the cultural history of equine science! Clever Hans — such a good boy. Incorporating agricultural history and animal studies into the fields of gender studies and STS is very important to me — I am always happy to find others to collaborate with and learn from! The photo is of me and my horse Dallas when we were both kids. We’re both much older now! I’ve always enjoyed thinking about it, discussing it, and wading into it. If you are lucky enough to have grandparents and parents that instill a sense of the past, I think that is grist for the mill. I went to the University of Kentucky for graduate school, and I drank the kool-aid, along with a bunch of hot browns and burgoo. I took jobs at the Kentucky Horse Park, and spent time at Keeneland. If I could have my ashes spread across the Haggin Course I would. Horse racing is such an important part of the American fabric. I think scholars, whether attached to a university or independents, like myself, can do much to shed light on the state of the sport. Honestly, I am concerned. The local track in the hamlet or even in the mid to large-size city is under attack. My hope is that somehow racing will not just be someday at a handful of tracks like Santa Anita, Gulfstream, or at the NYRA courses. We have to do all we can to lobby, cast our nets widely, and support the Sam Houston Race Parks and Turfway Parks in our universe too. Otherwise, its going to be pretty grim. That’s like asking which kid do you like the most. I am partial to turf runners because I truly believe that running on the grass is the way it should be. I know that sounds crazy, but the dirt just doesn’t do it for me. I got to see John Henry in person after he retired. But, all-time is Wise Dan. That record, his style, and just the way he battled back time and time again. It was impressive to witness. I just finished up this past summer a new brief on the history of the opioid epidemic. It is called A Time-Release History of the Opioid Epidemic, published through Springer’s History of Chemistry Series. This is the second brief (History of Aspirin was the first) that I have published with a good friend of mine who is a chemist called Steve Rooney. Writing together is a true joy and it has brought us closer together through some tough spots. Right now, I am focused on writing a weekly editorial for The Sports Haven. Long-term, Steve and I plan to complete a third volume on the history of Lasix and its impact on American thoroughbred horse racing. Stay tuned!